There are a lot of mobile check-in apps, photo apps and travel apps out there. But most of them keep where you went, how you got there and what that place looked like separate. HipGeo aims to put all of that information in one place with an iPhone (s AAPL) app that passively keeps track of your movements and can then, with just a few clicks, spit out a slick, animated travel diary. I used it on a cross-country road trip a few weeks ago. 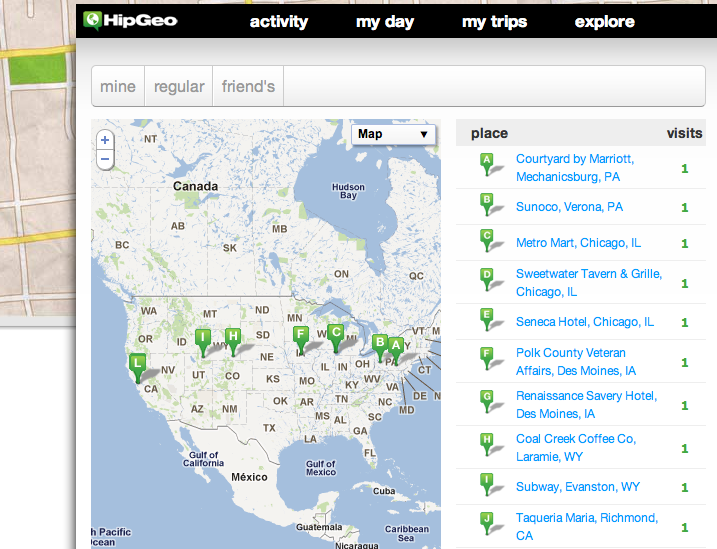 My overall impression is that HipGeo works well for keeping detailed records of a trip, dotted with comments and photos. I had a lot of fun creating my animated travel diary after the fact too — I’ll get to how easy it is in a bit. But this is also clearly just the beginning of what the three guys behind HipGeo, Los Angeles–based veterans of Yahoo (s YHOO) and a handful of other web startups, have in mind for this location-based service. Download the free app from the iOS App Store. To start off, I’d say don’t add friends until you see how HipGeo works and you can decide how much information about your movements you want to share. Flip on the “tracking” switch at the bottom of the home screen. You can pick “places” or “places and routes” mode. I picked the latter, which records your GPS location with the most detail. It not only sees the places you stop at, as the name suggests, but also knows the route you took to get there. Once that’s set up, most of the work of recording a travel diary is being done for you. How involved you want to be from here is your choice. You can “drop a pin” at a specific location. If you want to “pinpoint” it (HipGeo parlance for “checking in”), it will bring up places like restaurants, landmarks and businesses around you to choose from. You can also comment on the place, like you would with a status update. The most engaging parts of the final trip slideshow are going to be the photos you took along the way. One thing you’ll notice from mine is that I didn’t take nearly enough for such a long trip. So I’d encourage liberal use of your iPhone’s camera. You can just click the camera button in HipGeo, or you can upload photos from your device’s camera roll to associate photos with pinpoints logged during your trip. This was dead simple and far less work than I imagined. You sign in to the HipGeo site, click on “create and share trip” and all of your previous activity will show up. You can then pick the dates you’d like to share your movements from, and once it shows you that activity, you can uncheck the stuff you don’t want to include. You can also do a bit of cleanup. Let’s say you had a bunch of photos from Instagram, like I did, and forgot to associate them with places you pinpointed. No problem. You can upload them right from your computer to the site. You can also go back and comment on your activity. The biggest complaint I have is the way it sucked my phone’s battery life. But I chose to use the most power-intensive mode, “places and routes,” which keeps my device’s GPS cranking away all the time. The result is that I ended up with a very detailed record of my journey, but I only suggest this if you plan to be in a car with a charger. You can also select just the “places” tracking mode, which records your movements but not the exact route. HipGeo CEO Scott Daniel says this mode is designed to make a phone’s battery last all day. Alternatively, the least battery-intensive mode is to not turn on tracking and just take photos and drop pins. HipGeo will connect your route later, based on the locations of those activities. Privacy is also something I was concerned about. You should only add friends who you are comfortable with knowing exactly where you are when you have the app running in the background. HipGeo founder and head of product Rich Rygg says your activity within the app is, by default, shared with friends only. You can choose if you want someone other than approved friends to see your trip: You can choose to list the trip in HipGeo’s public directory, embed it on a blog or send out the link to it via email. HipGeo makes keeping track of your trips easy, since it’s mostly just happening in the background while you’re moving around and generally being a tourist. But Rygg and Daniel see much more opportunity, like friends and family knowing one another’s whereabouts — like, say, is your teenager exactly where she said she was going to be? — or just managing your daily activity. Using it to find the location of your friends on HipGeo, however, may be obviated for iPhone owners now that Apple has added that functionality to iOS 5 via the Find My Friends app. But much of the stuff they’ve got cooking sounds interesting, especially what they’re working on in regard to photos. For example, says Rygg, most people that shoot with high-end cameras end up with geotagged photos. “It would be cool to [automatically] drop photos you’ve taken into a timeline or put a map next to the photo” within HipGeo, he said.